If you are looking for a healthy way to replace take-out, you have to check out this Instant Pot Chicken Lo Mein! 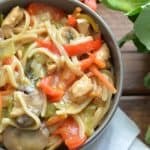 This one pot meal is made with tons of veggies, like snow peas, carrots, and mushrooms, as well as topped off with chicken in a delicious sauce! Turn Instant Pot onto sauté and wait for it to get hot. Add the sesame oil, garlic, onion, salt, pepper, and chicken. Cook until the chicken turns white and the onion is soft. Turn Instant Pot off. Break rice stir-fry noodles in half and layer in the pot on top of the chicken mixture. Add the chicken stock, lemon juice, rice wine vinegar, Hosin Sauce, and soy sauce. Don't stir. Layer all veggies and place lid on Instant Pot, placing the vent onto the sealing position. Select manual high pressure (or the pressure cook button on newer models) for 4 minutes. When timer is up, preform a quick release of pressure. Stir up the pot and let it sit for a few minutes to thicken.